As we wrote here a couple of weeks ago, Meaford Haven has completed the initial stages of developing this unique Three Seasons small-town Ontario retirement community. With the Draft Plan of Subdivision in place and a zoning bylaw amendment recently passed, you might be wondering what you can look forward to in the coming months. Simply put, these developments mean that the Municipality of Meaford and Grey County have given their approval for the Meaford Haven vision and all it entails: an aging-in-place retirement community that includes residences to accommodate each stage of your retirement (from bungalows to apartments to a retirement residence); gardens, a parkette and nature paths leading to the golf course next door; meandering, low-speed roads; commercial units offering health and every-day amenities; and a recreation centre/clubhouse. The plan and amendment provide guidelines, including what type of building can go where, how natural spaces will be preserved, where roadways will go, how far a building should be from the road, and what conditions a builder needs to satisfy in order to get building plans approved. Basically, the next steps are mapped out, and the Meaford Haven property is ready for a builder to take over the actual construction of the bungalows, apartments, and retirement residence. Meaford Haven is now engaged in talking to builders – with an initial focus on finding a builder who will build the bungalows and low-rise condominium apartments, but is also looking for a builder for the retirement residence building. Meaford Haven is moving to select a builder for this area within the next three months, and moving quickly, we’d look forward to having homes for sale by this summer, with the first few neighbours moving into Meaford Haven within the year. If you haven’t yet registered to take receive updates on Meaford Haven or to take part in our virtual focus groups to help design the community, do it today. On a winter evening in 1897, a 38-year-old Hamilton, Ontario woman named Adelaide Hoodless gathered her skirts and rose to take the lectern at the Farmer’s Institute Ladies Night meeting in nearby Stoney Creek. An emissary of the Ministry of Education, she spoke on “Domestic Science” and the importance of proper hygiene at a time when many rural families lived not exceedingly differently from their pioneer forebears. She was passionate about the topic. Eight years earlier, her 14-month old son, John, died from what folks called “summer complaint” – probably from drinking unpasteurized milk in the days when refrigeration during the summer months was difficult. In the years since, she had worked to establish domestic science education and taught classes in it – in an effort to provide better education for new mothers. That February night in Stoney Creek, Adelaide suggested that rural women should form a group devoted to broadening knowledge of domestic science and agriculture – as well as to provide an outlet for socializing. A week later, she returned to discover 101 women in attendance. 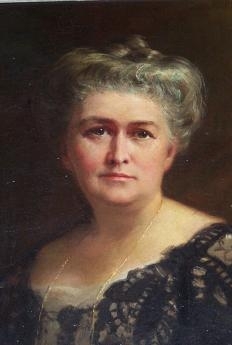 A week after that, Adelaide presided over the first formal meeting of the Women’s Institute as honourary president. Today, Women’s Institutes have spread around the world, and are particularly prominent in Britain, where they emerged in 1915 to revitalize rural communities and to encourage women to become more involved in producing food during the First World War. What does this tale have to do with our lovely town of Meaford, Ontario? Well, Meaford had its own WI, begun in 1902 and since disbanded, but the local St. Vincent WI has thrived since 1918. Your blogger recalls reading minutes of WI meetings in the Meaford Express 20 years ago, and thinking it a quaint, rural tradition – which was later reinforced by the portrayal of the stodgy WI members in the 2003 film Calendar Girls. It turns out there’s more to the Women’s Institute than that. In addition to action and advocacy on a variety of social issues over the decades, WIs provide a unique link to our past. Meaford and St. Vincent are fortunate to have this record, kept by the local WI in hand-written volumes over many years. To learn more about the St. Vincent WI, contact Shirley Moore at 519.538.1671.